Some 5,000 light-years away from Earth, in the constellation Centaurus, a spooky object is illuminating the skies: The Boomerang Nebula. This ghost-like cloud of gas is a planetary nebula, which, contrary to the name, is not actually a planet. These cosmic objects are formed when a red giant star runs out of hydrogen fuel, causing the core to collapse. Eventually, the outer layers are spewed out into the surroundings, resulting in a newly-formed white dwarf encased in a shell of luminescent gas. This will ultimately be the beautiful fate of 95% of all stars in the Milky Way; the rest will end their lives in spectacular explosions known as supernovae. 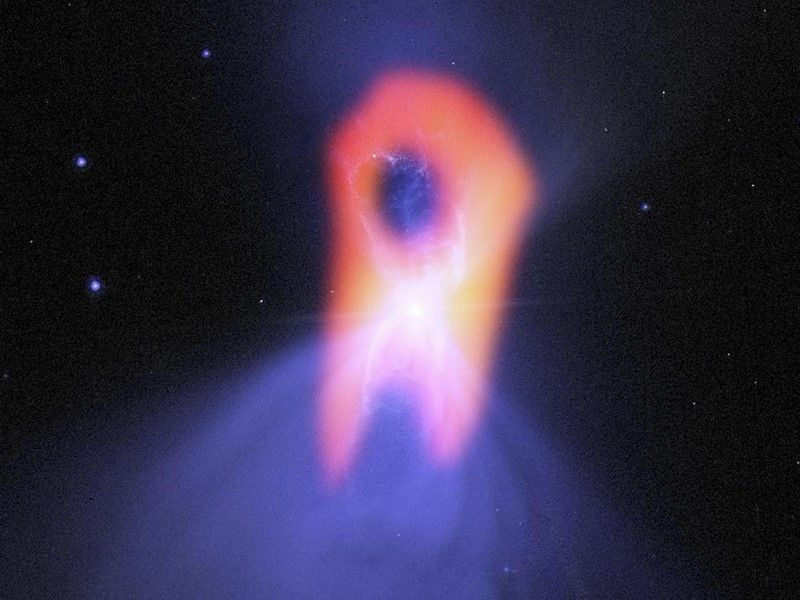 Alongside looking somewhat like a Halloween costume gone wrong or Kenny from South Park, the Boomerang Nebula, or the Bow Tie Nebula, is actually the coldest known object in the universe. Measurements of the cloud were taken last year by the Atacama Large Millimeter/submillimeter Array (ALMA), which is located in northern Chile. Incredibly, it was found to be -272oC (–458oF), or a mere 1 degree Kelvin. That’s chillier than the remnants of the Big Bang, or the cosmic microwave background. In visible light, the object has an odd hourglass shape. This is because a dense strip of tiny dust grains surround the star in the middle, masking a portion of it. This means that light is seeping out only in a narrow window, but in opposite directions through the cloud. The Boomerang Nebula is still young, so it’s not quite reached the stage of planetary nebula evolution where intense UV radiation emitted from the white dwarf causes the gas cloud to glow, emitting a wonderful array of colors. While it might be extremely cold at the moment, researchers found that its edges are gradually beginning to warm. This is possibly due to something called the photoelectric effect, which is where solid objects emit electrons after absorbing light. “Using ALMA, we were quite literally and figuratively able to shed new light on the death throes of a Sun-like star,” said Sahai.